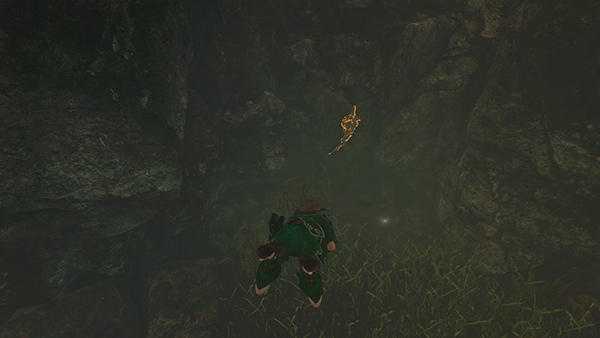 ...and you'll see a climbing wall and the familiar golden totems indicating a nearby Challenge Tomb. 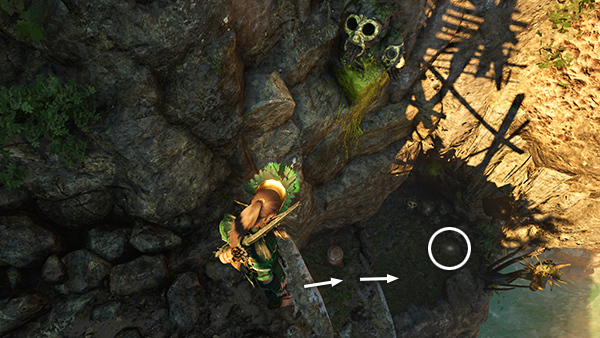 If you don't want to explore the tomb, you can jump directly to the climbing wall and continue with the next section of the main walkthrough. 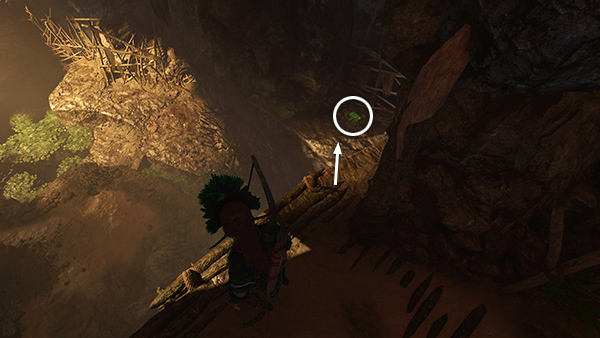 Otherwise, look over the edge to spot a survival cache (25/34) a few ledges below. Climb down, looting a resource container on the way. 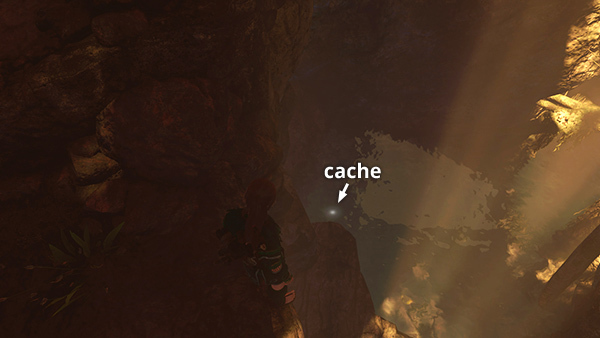 Dig up the cache. 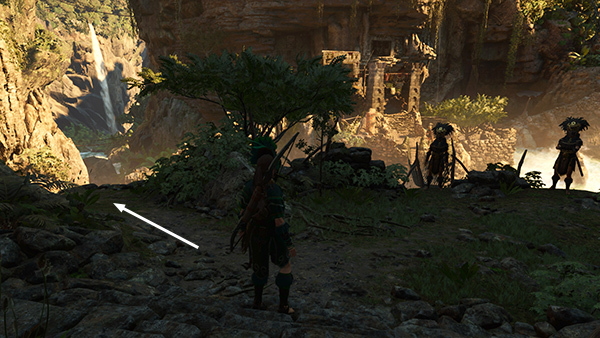 Then enter the tunnel on the left. 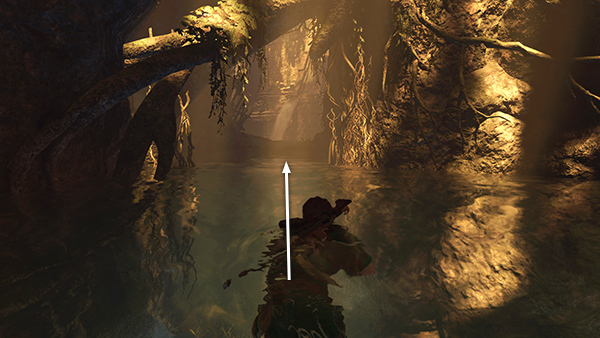 Follow the flooded passageway to the northwest, then north. There are two pockets of trapped air along the way but no major splits, so you can't really get lost. 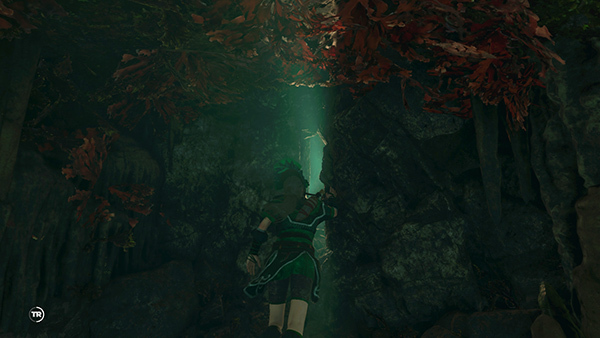 ...and surface in a cavern. 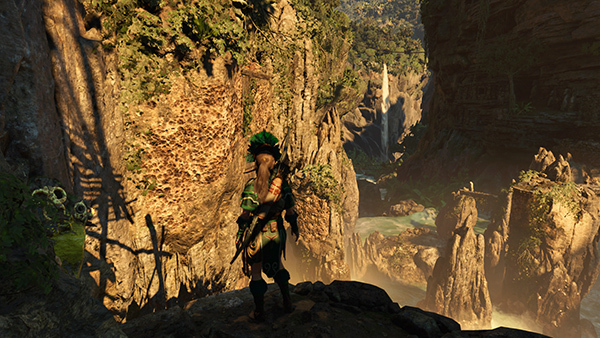 Climb out of the pool and scale the craggy wall to the ledge above. 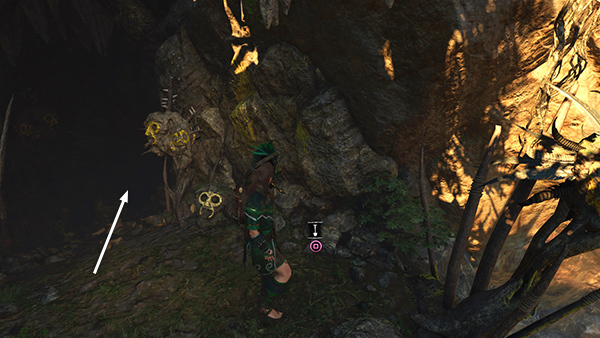 There's a relic (25/28), a Primitive Doll (Mam/Handmade Dolls), just ahead on the right. Examine it. 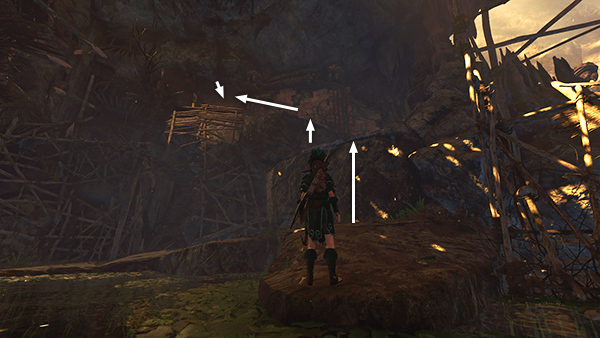 Then follow the sloping path on the left. NOTE: You're not imagining it. This artifact collection contains 5 identical primitive dolls. 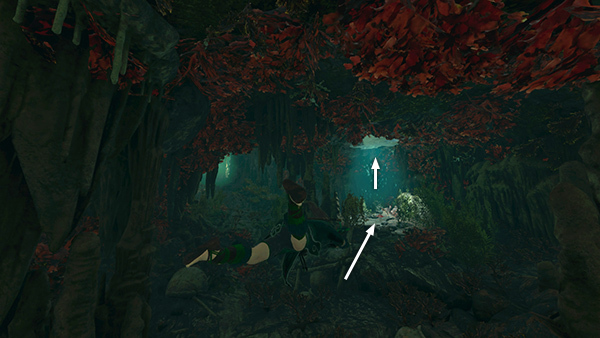 If you found the one in the Cenote, this will be the second. Move to the edge overlooking another pool. 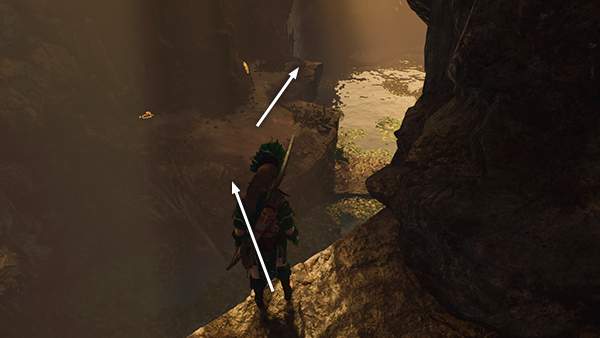 Jump down to the ledge below on the right to get some jade ore.
Jump across the pool to the opposite ledge, gather some mushrooms and hardwood, then move to the far end of the ledge. 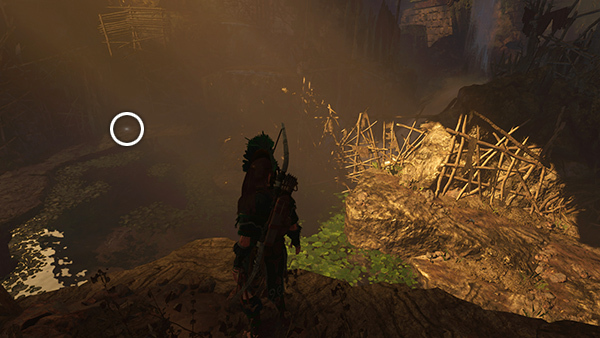 Dive into the water, gather a few resources on the bottom, then climb out on the northeastern ledge and dig up another survival cache (26/34). 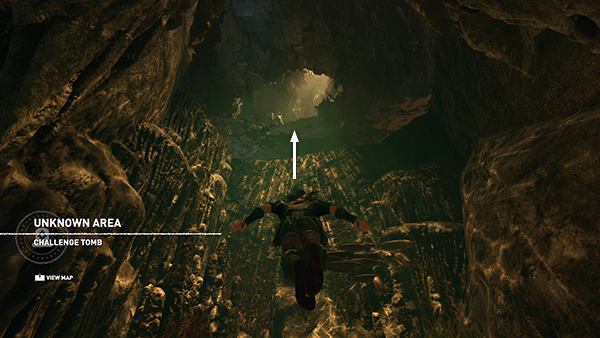 Climb the ledges on the southeast side of the cavern to reach the tunnel above. Examine the mural (17/23), Ancient Aqueduct (Mam/Trials of the Gods), on the right. Then continue along the tunnel. 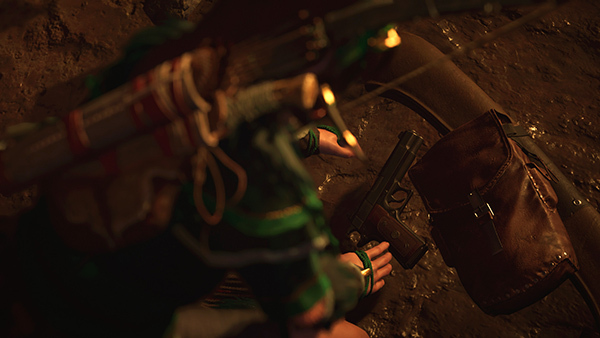 Lara pauses here to unwrap her pistol, indicating you're outside the city limits and can now access all of your weapons. Just ahead on the left is the Subterranean River Base Camp. 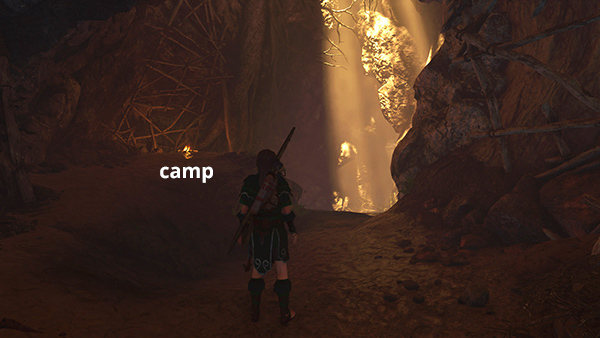 I've lit the campfire to make it visible in the screenshot. 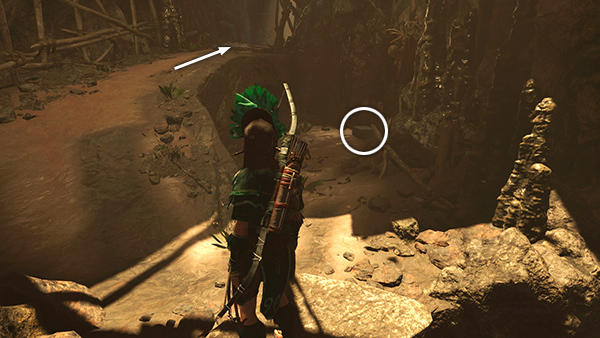 You don't have to stop here, but you should at least pass nearby to "discover" it, so you can fast travel back here later if necessary. ...dig up another survival cache (27/34). 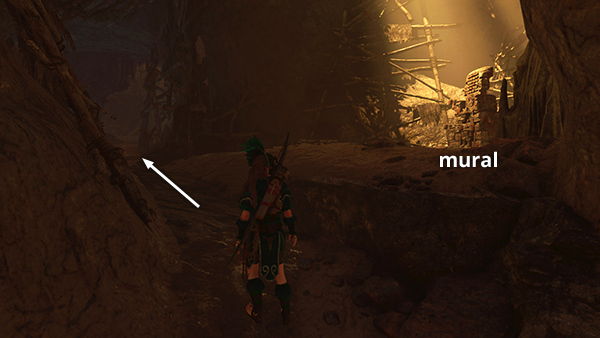 and pry some gold ore out of the wall. 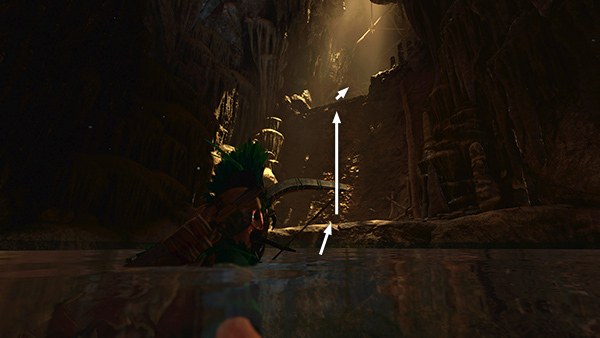 Then swim through the wide opening to the east to enter the tomb proper.